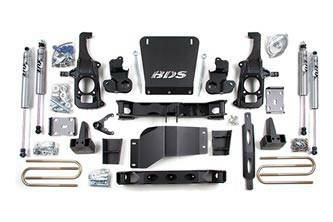 Once again BDS beats the competition and is first to market with this comprehensive High Clearance suspension lift kit. This 6-1/2" lift kit utilizes high arched crossmembers that blend perfectly with the angle of the factory installed lower control arms for a completely integrated look while lifting your vehicle a full 6-1/2"dramatically increasing ground clearance at the front crossmembers and improving operating geometry. Torsion bars are mounted directly to the top of the lower a-arm eliminating the need to drop the torsion bar crossmember. 1. Torsion Bar Tool required to load/unload the torsion bars. 2. 3" rear block kit recommended for dually applications, 5" rear block kit will not fit dually applications. 3. Stock 17" & 18" wheels cannot be reinstalled. 5. Factory dually wheels cannot be reinstalled. 6. Models with two piece rear driveshaft may require #121612. 7. If minor front driveline vibration occurs at highway speeds while in 4wd and the vehicle will be used in this situation on a regular basis, we recommend replacing the front driveshaft with a dual Cardan style driveshaft.